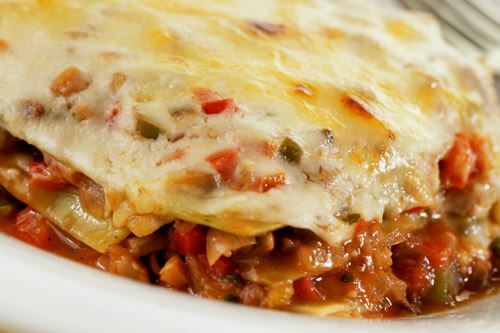 Vegetable lasagne is still the most popular vegetarian dish, but unfortunately it is often badly made, consisting of layers of lasagne with tinned tomatoes, onion and a few cubes of courgette in between. This is a more interesting lasagne recipe that uses chestnuts as the basis of the layered sauce. Serves 6. Preheat the oven to 190C/375F/Gas 5. Heat the oil in a medium sized saucepan and fry the onion for 2 minutes. Add the garlic and saute for 1 minute. Add the chopped mushrooms and peppers and saute for several minutes. Stir in the mashed chestnuts, tomato puree and herbs. Add a little stock or red wine, but don’t make the mixture too runny. Season to taste and simmer for 2 minutes. Allow to cool. Put half the chestnut mixture in the bottom of a rectangular ovenproof dish. Cover with pieces of lasagne making sure they do not overlap. Repeat the layers. Make a cheese sauce, season to taste, add a little freshly grated nutmeg if desired and pour over the top of the final layer of lasagne. Bake in the preheated oven for about 40-45 minutes until the lasagne has cooked and the sauce is golden brown on top.